Phone Banker also is known as Telephone Banker who handles services to clients pertaining to money management. Typical day-to-day activities of these professionals are listed on the Phone Banker Resume are as follows – promoting bank’s product and services through phone, answering inquiries and resolving problems, responding to routine queries and complaint from customers, solving doubts relating to financial products and services, working on special projects, coaching other bankers, and evaluating the customer’s eligibility, financial status for granting loans. 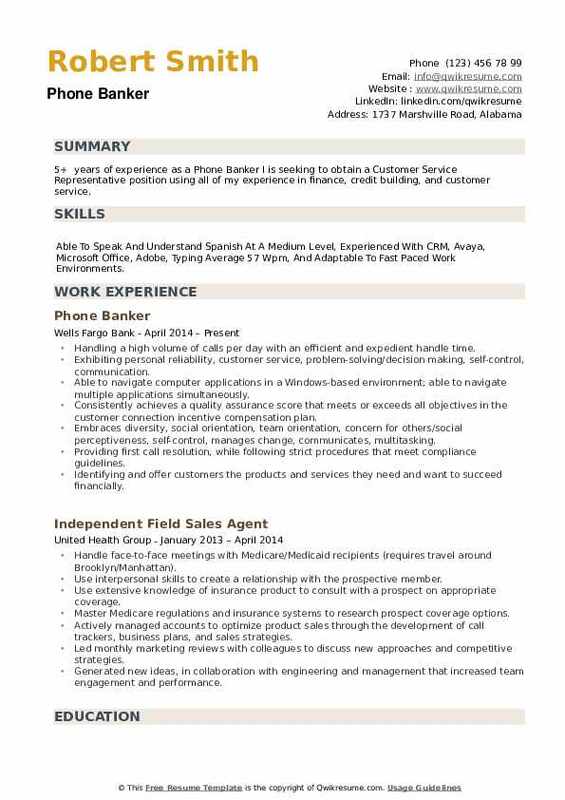 Job applicants for this role should be well-versed with banking policies and services, they should have telephone etiquette, and be able to use the banking software fluently. They also require computing skills and should have the ability to navigate between multiple applications and windows, and also be able to use the Search Engine Tools for getting the required information. Although no formal education is required, candidates wishing to take up this position should have at least an on-the-job training and experience. Objective : One year of experience as a Phone Banker I is seeking to obtain a professional position in an office environment where I can contribute my customer service and administrative abilities to help meet organizational goals. Skills : Typing Up To 55 Wpm, 10-key, Using More Than One Program At Once, Customer Service And Front Desk Experience. Responding to routine and complex customer inquiries regarding customers products and services. Delivering exceptional service to my customers by going out of the way to please them. Providing first call resolution, while following strict procedures that meet compliance guidelines identify and offer customers the products and services that they need and want to succeed financially. Navigating multiple computer systems, applications, and utilize search tools to find information. Working with confidential information while maintaining confidentiality within company guidelines and handling confidential and private information with the utmost care and respect. Processing large volumes of time-sensitive and confidential documents in a fast paced high production environment in which it was necessary to accurately review large volumes of paperwork on a daily basis and within tight time frame constraints. Performing data entry into the computer and updated information; reviewed computer reports for follow up actions and processing accuracy worked in a team environment and independently with the ability to prioritize timelines. Providing excellent and strong customer service in a professional manner. General clerical work, including typing, word processing, and generating documents. Headline : A keen customer service representative, with 5+ years of experience in delivering quality service to partners and customers. Accomplished in meeting deadlines while multi-tasking and completing civilian and military duties. In addition, communicating with and briefing higher authorities with critical information in regards to operations to the organizations as well as accountability and promotions. 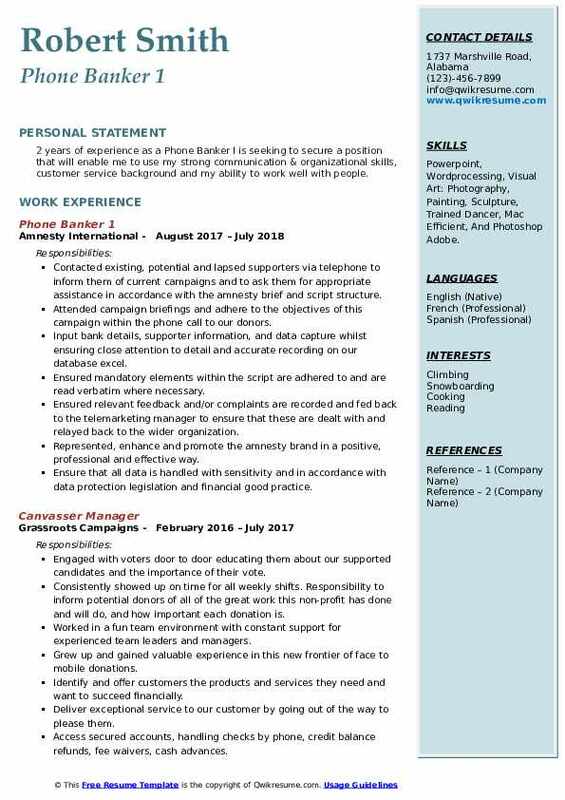 Skills : Bilingual, Sales, Microsoft Word, Entering Computer Data, Customer Service, And Management Experience. Adhering to operational controls, including legal, corporate, and regulatory procedures to. Partner with other areas (commercial banking, mortgage, treasury management) to ensure. Ongoing communication with regard to existing and future customer needs. Navigating multiple windows and applications while utilizing search tools to find information. Completing proper documentation and perform data entry as assigned to specific. Maintaining proper and efficient customer service levels while de-escalating calls if necessary. Completing initial service for the call while ensuring customer satisfaction is met by all service. Needs including additional information that will be beneficial to business needs. Transfers of money, wires, complete check order processing, and changing service packages. Summary : 8 years of experience as a Phone Banker I. Customer Service Oriented Professional who maintains a high level of professionalism and efficiency to eliminate customer dissatisfaction and increase customer loyalty. Excellent research skills Detail-oriented Outstanding written communication skills Meets/exceeds goals. Skills : Video Editing, Software Development, Athletic Training, Writing, Proficient In Using Email Outlook, Spread Sheet, Microsoft Office Applications Such As MS Excel, MS Word, MS Outlook, And MS PowerPoint. Responds to inquiries and concerns to alleviate delicate situations regarding clients checking and savings accounts with professionalism and sensitivity. Provides complaint resolution through root cause analysis and service recovery to retain existing clients and increase customer satisfaction. Demonstrates mastery of customer service call script within specified timeframes and quality standards. Coaches and mentors fellow customer service representatives in the call center. Develops effective relationships with all call center departments through clear communication. Assists clients in filing credit disputes on unauthorized or fraudulent purchases. Received the shared success award for contributions to diversity inclusion, as well as teamwork partnership. 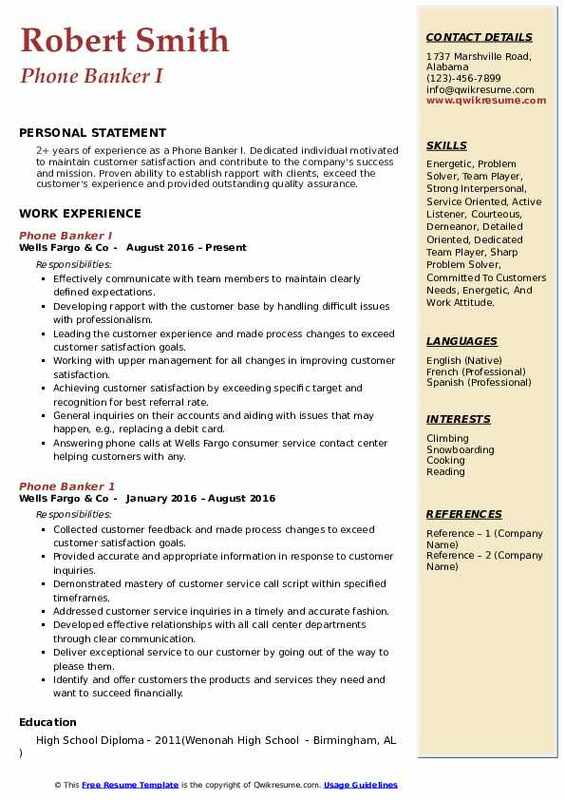 Objective : 3+ years of experience as a Phone Banker I is seeking to challenge myself as a call center agent and utilize my professional sales skills, administration and customer service skills in a professional environment. 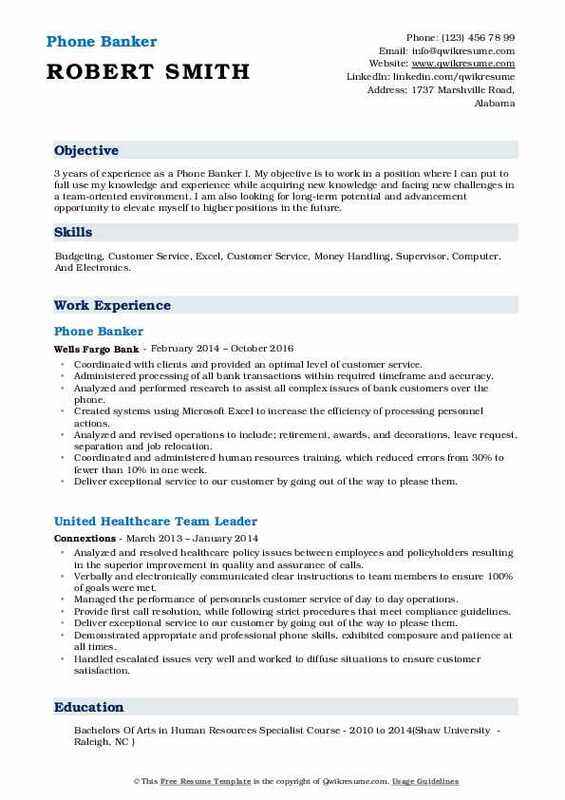 Skills : Customer Relationship Business Development Training & Education Banking & Finance Sales Microsoft Office Policy Adherence Computer Proficient In Word, Excel, PowerPoint, Outlook. Demonstrating better collaboration by seeking and acting on feedback from teammates and partners from other departments. Research and resolve perplexed customer inquiries regarding a loan, credit, and consumer accounts. Utilized strong customer service skill to create a positive first impression to all customers. Navigate standard operation procedures to critically solve problems and develop customer relationships. Handle incoming correspondence such as answering emails, and received calls from internal and external sources rearguing multiple financial accounts. Assist customers with consumer checking, savings, CDs, ira, credit card, and loans. Direct telephone inquiries and general information efficiently and in a timely manner, timely and clear communication with customers. Objective : 2 years of experience as a Phone Banker I is seeking to secure a position that will enable me to use my strong communication & organizational skills, customer service background and my ability to work well with people. Skills : Powerpoint, Wordprocessing, Visual Art: Photography, Painting, Sculpture, Trained Dancer, Mac Efficient, And Photoshop Adobe. Contacted existing, potential and lapsed supporters via telephone to inform them of current campaigns and to ask them for appropriate assistance in accordance with the amnesty brief and script structure. Attended campaign briefings and adhere to the objectives of this campaign within the phone call to our donors. Input bank details, supporter information, and data capture whilst ensuring close attention to detail and accurate recording on our database excel. Ensured mandatory elements within the script are adhered to and are read verbatim where necessary. Ensured relevant feedback and/or complaints are recorded and fed back to the telemarketing manager to ensure that these are dealt with and relayed back to the wider organization. Represented, enhance and promote the amnesty brand in a positive, professional and effective way. Ensure that all data is handled with sensitivity and in accordance with data protection legislation and financial good practice. 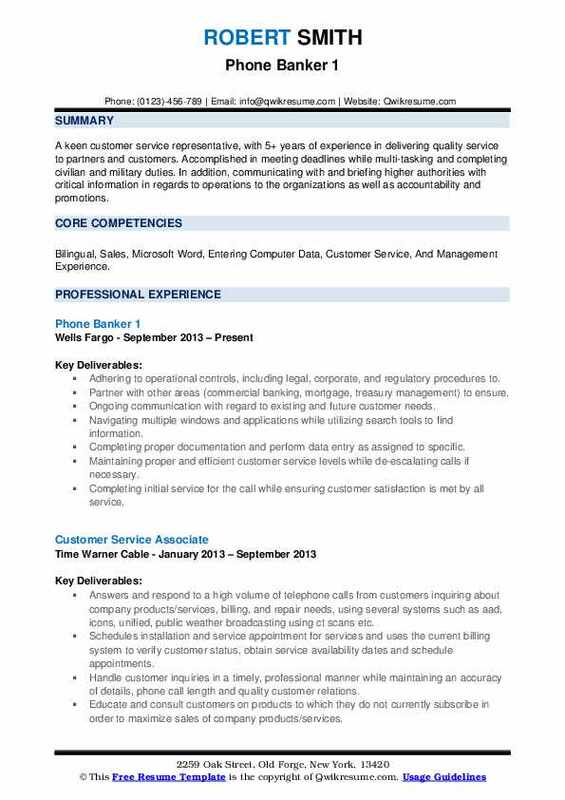 Objective : 3 years of experience as a Phone Banker I. My objective is to work in a position where I can put to full use my knowledge and experience while acquiring new knowledge and facing new challenges in a team-oriented environment. I am also looking for long-term potential and advancement opportunity to elevate myself to higher positions in the future. 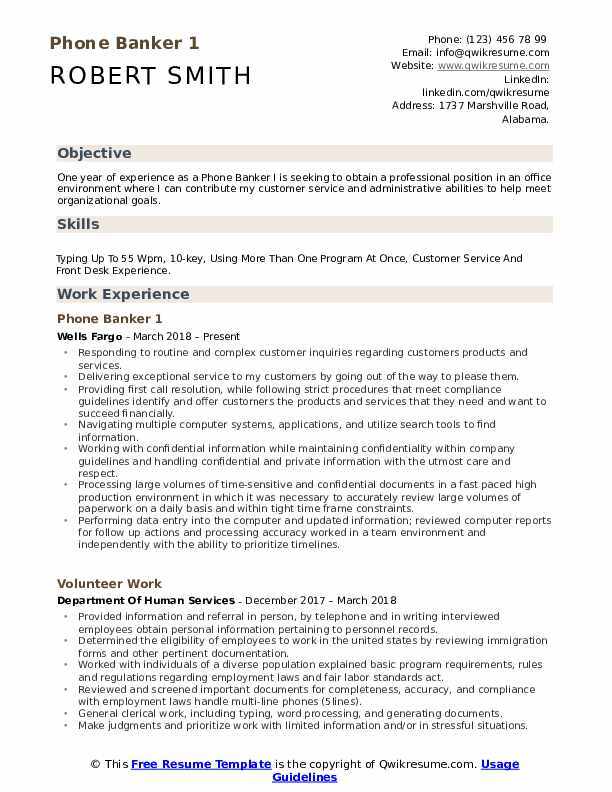 Skills : Budgeting, Customer Service, Excel, Customer Service, Money Handling, Supervisor, Computer, And Electronics. Coordinated with clients and provided an optimal level of customer service. Administered processing of all bank transactions within required timeframe and accuracy. Analyzed and performed research to assist all complex issues of bank customers over the phone. Created systems using Microsoft Excel to increase the efficiency of processing personnel actions. Analyzed and revised operations to include; retirement, awards, and decorations, leave request, separation and job relocation. Coordinated and administered human resources training, which reduced errors from 30% to fewer than 10% in one week. Deliver exceptional service to our customer by going out of the way to please them. Provide first call resolution, while following strict procedures that meet compliance guidelines. 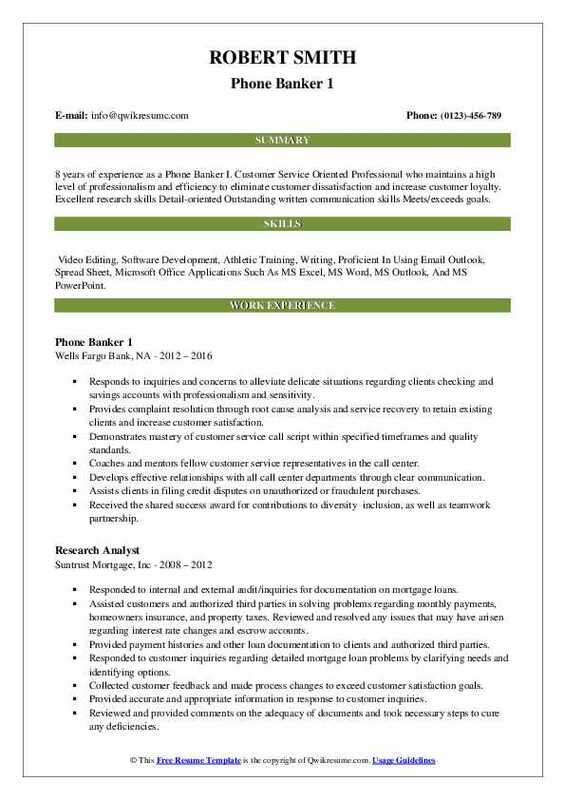 Objective : 3 years of experience as a Phone Banker I, Driven and caring professional with experience in customer service, cross-functional collaboration, and team leadership. Hardworking and ambitious with proven success in utilizing these skills to provide hands-on leadership and employee training. Resolved customers service and billing complaints by performing activities such as acknowledging customers request, and providing world-class customer service. Referred unresolved customer grievances to designated departments for further investigation. Determine charges for services requested, collected deposits and payments and arranged for billing. Responsible for making sure customer hung up with a smile on their face. Checked to ensure that appropriate changes were made to resolve customers problems and accounts were in good standing. 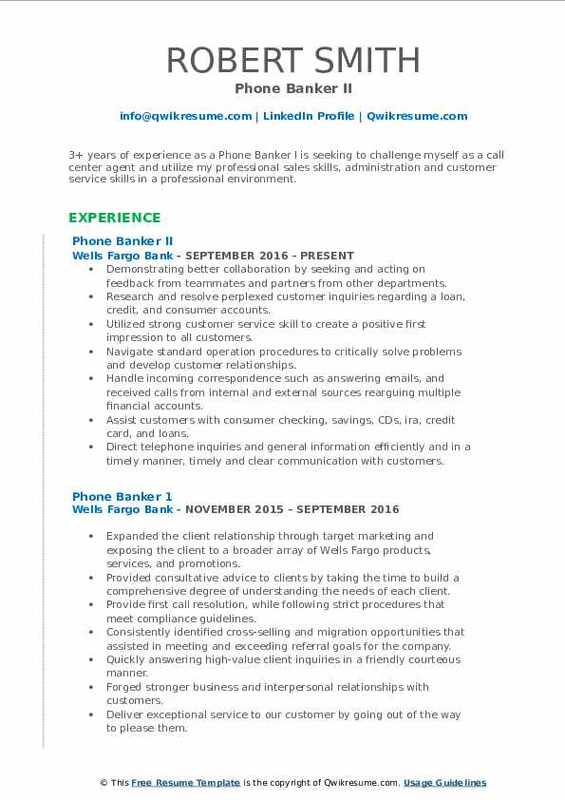 Objective : 2+ years of experience as a Phone Banker I. Dedicated individual motivated to maintain customer satisfaction and contribute to the company's success and mission. Proven ability to establish rapport with clients, exceed the customer's experience and provided outstanding quality assurance. Skills : Energetic, Problem Solver, Team Player, Strong Interpersonal, Service Oriented, Active Listener, Courteous, Demeanor, Detailed Oriented, Dedicated Team Player, Sharp Problem Solver, Committed To Customers Needs, Energetic, And Work Attitude. Effectively communicate with team members to maintain clearly defined expectations. Developing rapport with the customer base by handling difficult issues with professionalism. Leading the customer experience and made process changes to exceed customer satisfaction goals. Working with upper management for all changes in improving customer satisfaction. Achieving customer satisfaction by exceeding specific target and recognition for best referral rate. General inquiries on their accounts and aiding with issues that may happen, e.g., replacing a debit card. Answering phone calls at Wells Fargo consumer service contact center helping customers with any. Handling inquiries and concerns in order to eliminate the need for clients to travel to the bank in person. The types of issues ideal with usually concern customer deposits, withdrawals, transactions, and problem-solving. 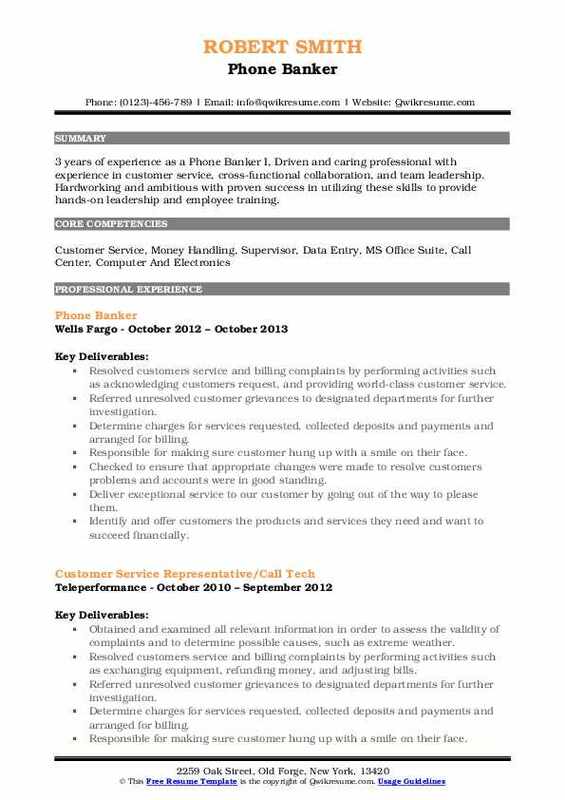 Headline : 5+ years of experience as a Phone Banker I is seeking to obtain a Customer Service Representative position using all of my experience in finance, credit building, and customer service. Skills : Able To Speak And Understand Spanish At A Medium Level, Experienced With CRM, Avaya, Microsoft Office, Adobe, Typing Average 57 Wpm, And Adaptable To Fast Paced Work Environments. Handling a high volume of calls per day with an efficient and expedient handle time. Exhibiting personal reliability, customer service, problem-solving/decision making, self-control, communication. Able to navigate computer applications in a Windows-based environment; able to navigate multiple applications simultaneously. Consistently achieves a quality assurance score that meets or exceeds all objectives in the customer connection incentive compensation plan. Embraces diversity, social orientation, team orientation, concern for others/social perceptiveness, self-control, manages change, communicates, multitasking. Providing first call resolution, while following strict procedures that meet compliance guidelines. Identifying and offer customers the products and services they need and want to succeed financially.